FIFA World Cup 2018 is near to start and officially will be kicked off on 14th June, 2018 with the first game to be played between host Russia and Saudi Arabia. Champion of this event will lift this iconic Trophy on 15th June, 2018. The football fans have witnessed too many Football World Cup Trophies, lets have a look on the previous trophies in history of FIFA World Cups. The current FIFA World Cup Trophy is an Avatar of that trophy used in World Cup 1974 that has been awarding to the winners of World Cup since then. Replica of that trophy has been awarding to the winners as until a team wins for three times consecutively, FIFA has kept the trophy till then. This Trophy (1974) is one of the most iconic sports trophies in the World. height of this trophy is 36.8 centimeters, while the total weight is 6.1 kilogram (13.44 lbs). Replica Trophy 2018: Replica trophy of 1974 trophy is made by Stabilimento Artistico Bertoni, a company from Italy. The shape of this trophy is like two men holding the earth. 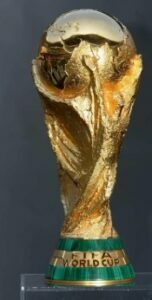 While the bottom of this Trophy acquires the two times winners name including Germany, Argentina, Brazil and Italy. If one of them wins the trophy, they will keep the real trophy instead of it’s replica. The first ever trophy of World Cup was awarded back in 1930 and was named “Jules Rimet” after the name of president of FIFA who helped the association to organize the event. white and yellow marble in the foundation (bottom). Jule Rimit trophy was about 3.8 Kg in weight while 35 centimeters in height. Uruguay lifted that trophy in 1930. As per to the rule back in 1930, the winner of World Cup would return back to the association. Brazil lifted that trophy when they won FIFA World Cup back in 1970 and this “Jules Rimet” trophy has been displayed at Brazil Football Association headquarter.